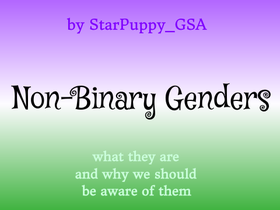 This account was created by @star-kwafie and @puppymk for our Gender and Sexuality Alliance! However, it's now mostly run by star-kwafie, and used for general LGBTQ-related things. This account is extremely inactive, but does respond to comments sometimes! Both of us use they/them pronouns. Pan, Bi and Lesbian/Gay Scratchers!